After facing severe security issues with the latest iOS 6, Apple had prematurely released the iOS 6.1.1 update last week. Yet again, another update is released with bug fixes for the Exchange calendar bug. 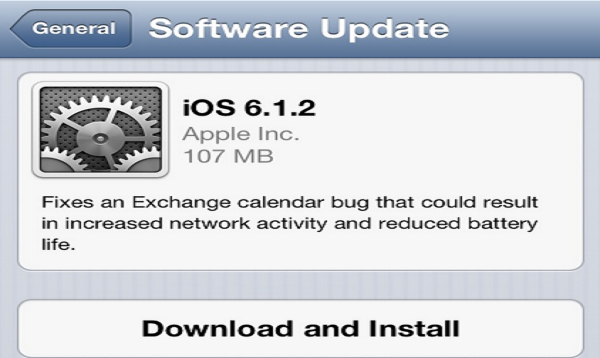 The iOS 6.1.2 which was released by Apple with the build number 10B146 fixes the Exchange calendar bug that was resulting in increased network activity and reduced battery life. The AOL users of iOS 6 faced the issue with their calendar where their meetings were getting randomly planned. Not only that but this update claims to have patched the unauthorized unlock issue for some users. The users iPhone could be easily unlocked by bypassing the unlock screen thus creating a security concerns amongst users. We expect another update to the iOS 6 in the next couple of weeks. Hopefully the next update might improve the performance of maps. The company has been forced to release updates after many exploits coming to fore in their devices running the iOS 6. The iOS 6.1.3 which is expected to be a fully serviced update may finally put an end to the woes of the Apple users.